The G1E is a 40-Port Hybrid IP Communication System combining the advantage of traditional telecommunications along with the convergence of VoIP technology allows a flexible a solution that best suits the diverse needs of your business. The G1E offers a unique combination of outside line interfaces. It can serve as a branch office system for VoIP multi-site applications. Or choose between efficient ISDN lines or PSTN. The G1E offers a cost effective thoughtfully designed â€œHospitality Solutionâ€� for Motels and Hotels with between 5-20 rooms. The G1E with its multiple integrated systems means you can say â€œGoodbyeâ€� to training headaches and servicing various equipment types and say â€œHelloâ€� to a solution that incorporates your desired mix of administrative and Guests telephones, options of Auto Attendant, Room Voice Mail, Front Desk Operations, Guest Services, Call Accounting and Much More. All G1E systems are equipped with a standard Auto Attendant and recordable Music-on-hold feature. The optional in-skin Voice Multi-Service card will add the following valuable voice service features. Auto Attendant Increases the standard 4 ports to 6 automated attendant ports to answer in-coming calls simultaneously. Voice Mail Every station has a dedicated voice mail box to let callers leave messages when the user is busy or away from their desk. The Virtual Mail Box is available to provide many special features, such as group mail box, selective product promotion announcement, etc. Conference Rooms There are up to 5 conference rooms, each room has maximum 8 participants. Total 16 participants could be talked in the same time. Conference Recording Record conference calls when needed. Answering Machine Feature Listen to caller leaving a message in your mailbox and answer the call by just lifting the handset. On-line Recording Record important or malicious conversations when needed. On demand as required or every call automatically. Easy Installation Factory Ready - All G1E Telephone systems are "ready to go" right out of the box. A well thought out default database is factory installed on each system which meets the needs for most installations. This alleviates hours of on site time, minimizing installation costs for both dealer and customer. Solid-state design minimizes trouble and eliminates periodic maintenance. Expansion- Various Interface Cards for simple, modular expansion. Versatile programming and options for ease of selection. Database Flash Memory Back Up - Customer data is backed up when the power is turned off and there is no battery to replace. Battery Back Up (System Operation) - GE systems can be equipped with an optional battery back up which keeps the system operational in the case of a commercial power failure. Customer Care Programming - Customers and service personnel can easily communicate and perform programming right over the telephone. 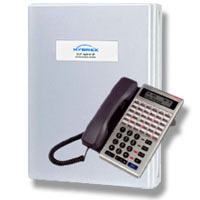 HYBREX telephone systems allow programming and voice conversations to be performed at the same time. Advanced software upgrades â€“ Through the RS232 connection, system software can be upgraded easily without replacing any firmware.